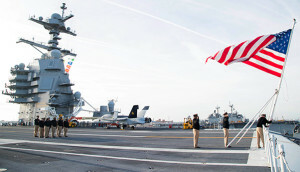 Sailors assigned to the aircraft carrier USS Gerald R. Ford’s (CVN 78) Chief’s Mess conduct colors on the ship’s flight deck in commemoration of the 125th anniversary of the chief petty officer rank. The Navy’s newest aircraft carrier, USS Gerald R. Ford (CVN 78), departed Naval Station Norfolk on Sunday, July 15, 2018 to begin a post-shakedown availability (PSA) period at Newport News Shipbuilding in Newport News, Va.
As the ship closes in on one year since its commissioning, the first-in-class aircraft carrier has seen many ‘firsts,’ with the ship and crew exceeding expectations in some cases. Since first getting underway on her own power April 8, 2017, Ford has safely conducted 10 underway evolutions and completed all of the testing required prior to beginning the PSA. Following her delivery on May 31, 2017, the ship has operated for 81 days at sea during seven independent steaming events (ISE), supported by in-port Windows of Opportunity (WOO). Ford has also successfully completed fixed-wing aircraft/helicopter integration and compatibility testing, air traffic control center certification, JP-5 fuel system certification, daytime and nighttime underway replenishment capability demonstrations, ship’s defensive system demonstration, Dual Band Radar (DBR) testing, and propulsion plant operations. One of the most rewarding aspects of bringing Ford to this point has been execution of the fleet’s first shipboard Electromagnetic Aircraft Launching System (EMALS) launches. Ford’s Air Department, combined with the efforts of Huntington Ingalls Newport News Shipbuilding and Naval Air Systems Command Joint Test Group, successfully executed complete system testing events for all 13 redesigned Aircraft Launch and Recovery Equipment weapon systems, including the first 747 shipboard landings – the first coming only six days following the ship’s commissioning – utilizing the Advanced Arresting Gear (AAG), against a plan of approximately 400. Ford’s Operations Department synchronized with Carrier Air Wing Three (CVW-3), CVW-8, Helicopter Sea Combat Wing Atlantic, Helicopter Maritime Strike Wing Atlantic, and numerous PMS-378 test organizations to safely and successfully complete 454 mishap-free rotary and fixed-wing sorties and 1,173 flight hours. The crew also executed 25 air defense and surface tracking exercises, the initial structural test firing of the Close-In Weapons System (CIWS), and all development testing of the Integrated Combat System. Further, the carrier’s crew successfully executed the night carrier qualification of 78 Fleet F/A-18 pilots, significantly enhancing the combat readiness of both CVW-3 and CVW-8. Ford’s Air Operations team also developed, prepared and trained robust procedures for conducting air traffic control with the first-of-its-kind DBR. 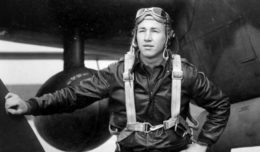 This led to Ford becoming the fleet’s first aircraft carrier to conduct fixed-wing positive, advisory and monitor control with organic phased-array radar, establishing precedence for the next generation of Naval Aviation. Another notable system that separates the ship from her Nimitz-class predecessors is the Navy’s first Plasma Arc Waste Destruction System (PAWDS), which allows Ford to dispose of trash in an environmentally safe manner. Ford’s Engineering team oversaw major developmental milestones, including the safe installation, integration, and operation of the system. Overcoming system challenges consistent with any ‘first’ system, the Engineering team’s efforts resulted in system improvements, serving to increase overall system availability from less than five percent to more than 90 percent. For Capt. Brent Gaut, Ford’s executive officer, it was the “old-fashioned Sailor ingenuity, tenacity, and intelligence” of Ford’s Sailors that saw the ship through to this point. Overall, the ship’s crew identified and corrected numerous system challenges that will be implemented in follow-on Ford-class CVNs. Collectively, the work done in the ship’s first year of service has brought a tremendous amount of knowledge to the Ford-class program. During PSA, adjustments will be made to bring Ford closer to becoming an active member of the fleet of global force aircraft carriers.